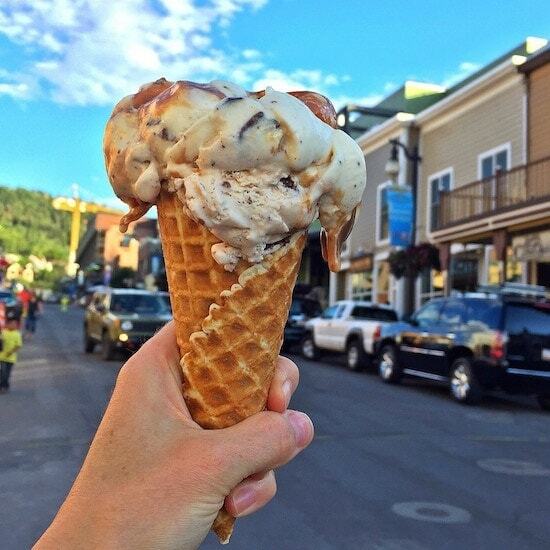 Last weekend, we drove up to Park City, Utah for a little staycation with Visit Park City. Park City is only 20 minutes from our house, but every time we go up there we feel like we are worlds away from home. 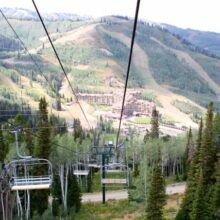 We love visiting Park City during the winter, it is the ultimate ski destination, but the summer months are just as fun. 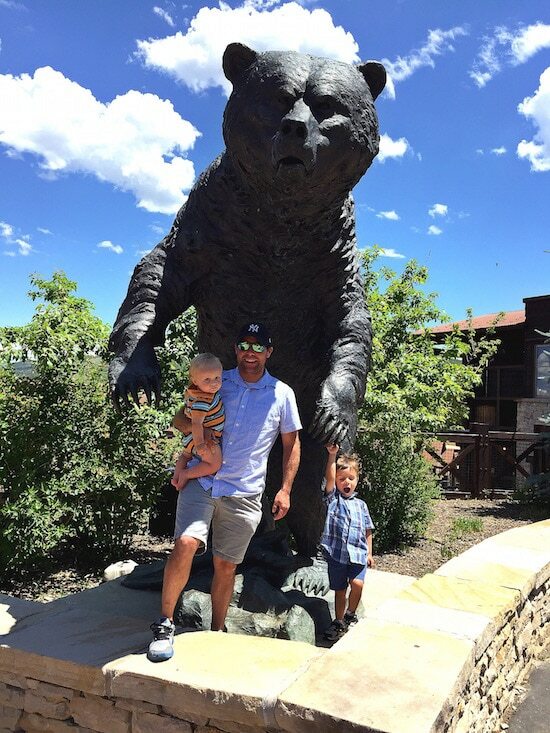 Park City is the perfect spot for a family vacation, all year round! We started our staycation at Silver Star Cafe, which is a rustic cafe with a gorgeous view of Park City. 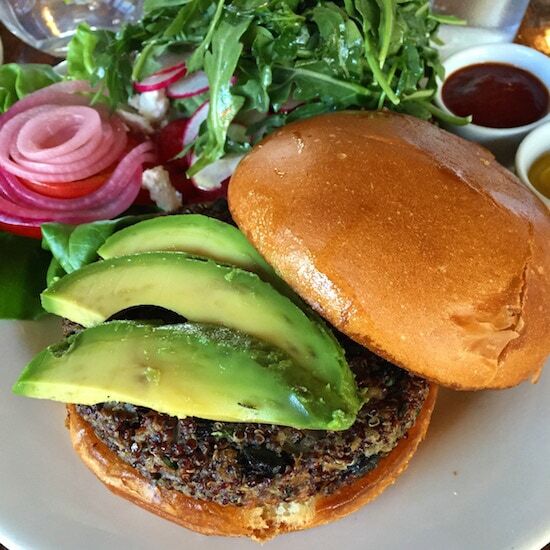 I enjoyed the black bean quinoa burger and watermelon arugula salad, both were super tasty! The boys ordered regular burgers and fries and gave them two thumbs up! Caleb chose strawberry shortcake for dessert! The shortcake kissed him on the cheek:) He was one happy camper! We stayed at Trails End Lodge at Deer Valley Resort. Our two bedroom condo was located right by Snow Park Lodge. We had a gorgeous view of the mountains and it was nice having a kitchen and lots of space with the kiddos. For dinner, we went to Maxwell’s. 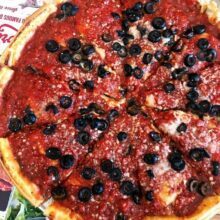 That’s right, they named a pizza place after Maxwell:) We love eating at Maxwell’s because it is super family friendly and the food is excellent. 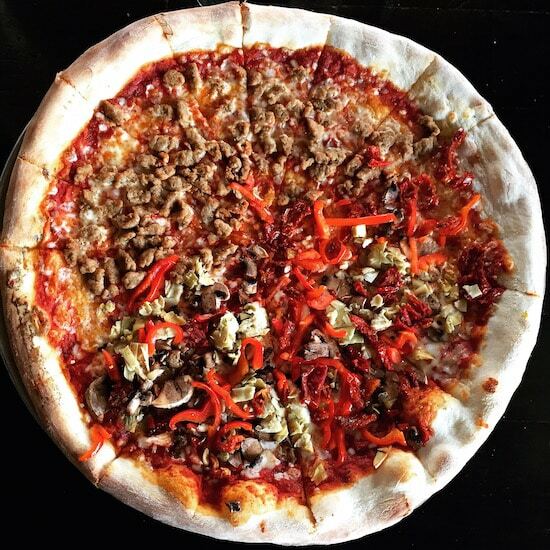 You can’t go wrong with their East coast style pizza. We ordered half sausage (for the boys) and half veggies (for the mama)! Everyone was happy! When we were finished eating, we enjoyed the outdoor concert that was going on right outside the restaurant. The boys loved dancing to the music! I had a double scoop, brownie explosion and their signature ice cream, which is vanilla with caramel, Heath, and dark chocolate. SO good! Look at that caramel drip! I want another lick NOW! In the morning, we went on a family bike ride on the Union Pacific Rail Trail. They boys had so much fun! They were talking, laughing, and enjoying the scenery! It was a gorgeous day in Park City! After our bike ride, I went on a chocolate tour at Ritual Chocolate. Ritual Chocolate handcrafts small batch, bean-to-bar chocolate using the early traditions of chocolate making to bring together old European methods with a modern American style and they have a small factory in Park City. 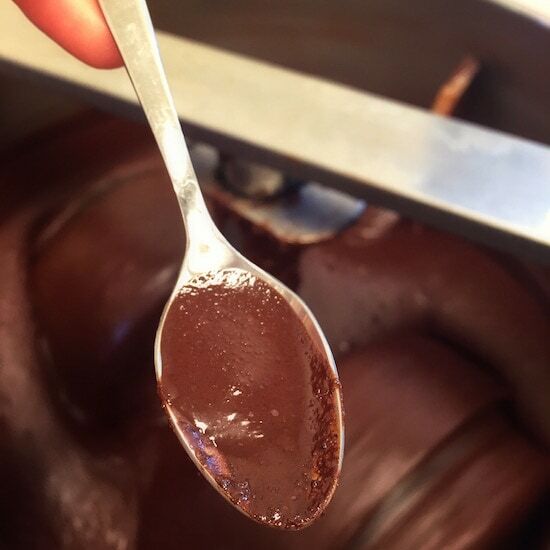 I loved watching the chocolate be made and of course the tasting was fun too. I LOVE their Fleur De Sel bar. It is so good! For lunch, we went to El Chubasco, a local’s favorite! It’s in a shopping center, nothing fancy, but the food is really good and they have a killer salsa bar. 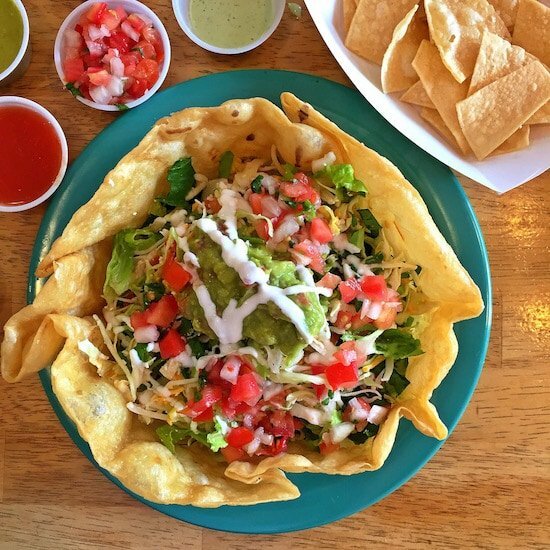 I loved my taco salad! 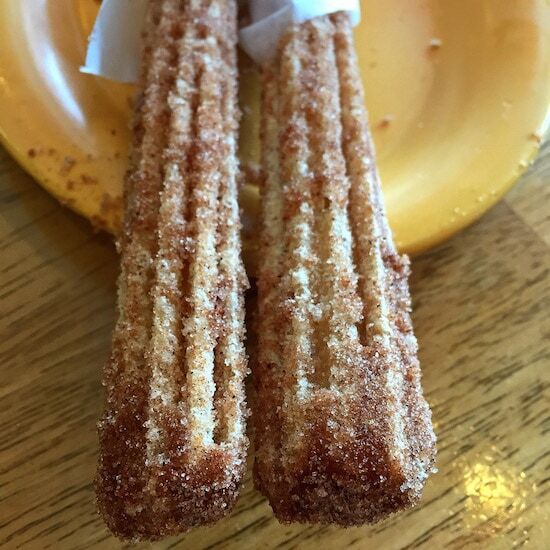 The boys saved room for churros! We spent the afternoon at the pool! For dinner, we went back to Main Street to dine at Zoom, Robert Redford’s famous restaurant. We had an amazing meal! Everything was perfect. 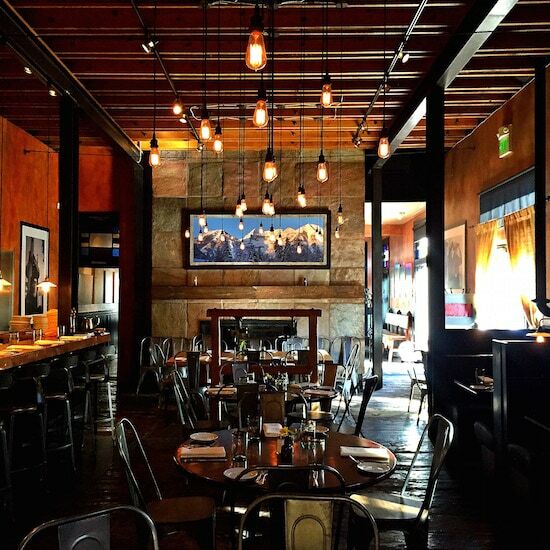 We loved the atmosphere, food, and service. A few favorites were the beet salad, Mexican style corn, sweet potato fries, peach crisp, and Navajo fry bread. Oh, and they have a kids dessert menu! Caleb loved the dirt cup! 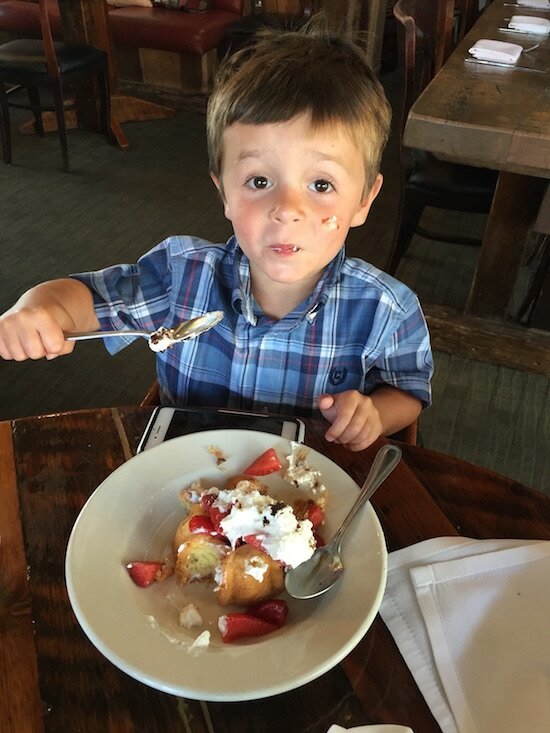 It kept him happy so we could enjoy our dessert. We can’t wait to go back! 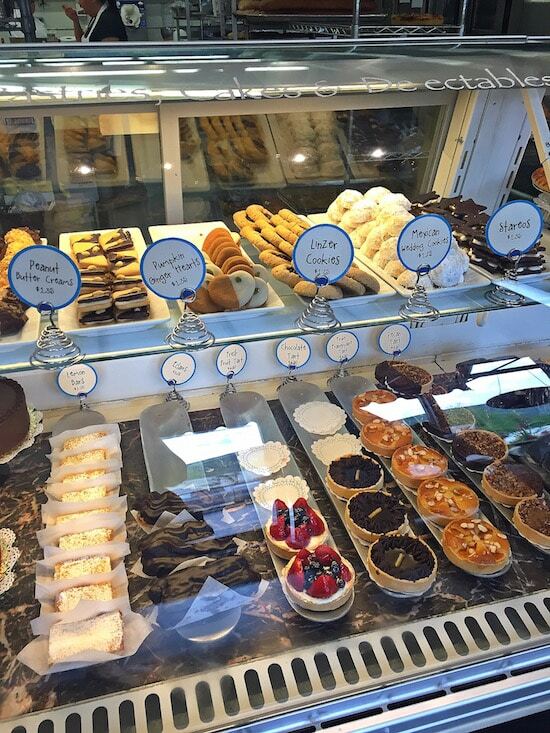 Of course, I made time to stop by Windy Ridge Bakery! The pumpkin ginger heart cookies and peanut butter creams were my favorite! Josh loved the lemon bar! 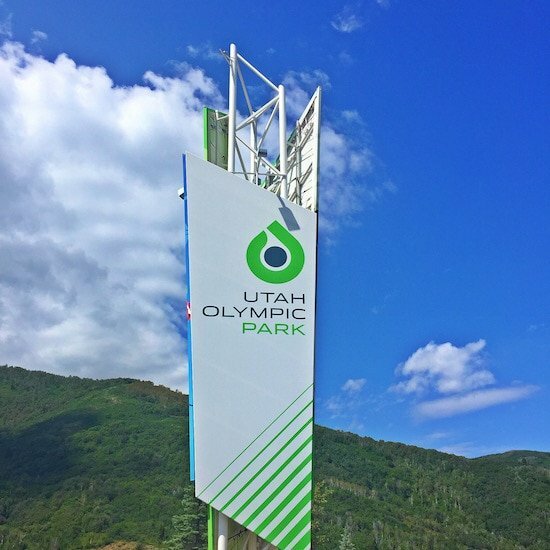 We also visited Utah Olympic Park. The park hosted bobsleigh, skeleton, Luge, Nordic Ski Jumping, and Nordic Combined events during the 2002 Olympic games. We went to the Flying Ace All-Stars Freestyle Show and it was awesome! 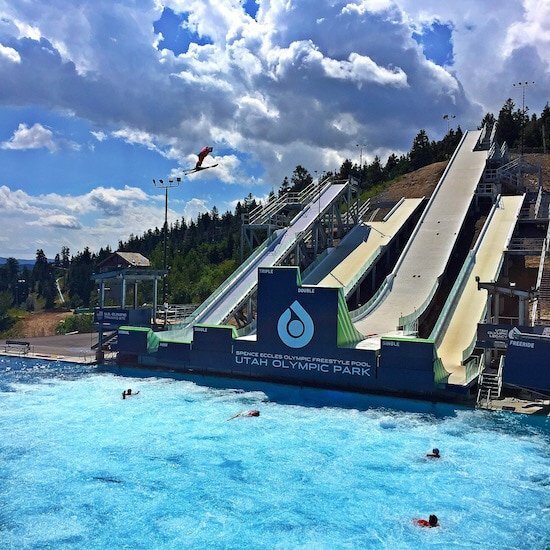 Olympians and National Team skiers and snowboarders perform acrobatic feats as they soar up to 60 feet in the air before landing in the big air pool. Caleb also rode the alpine slide and played in the discovery zone. 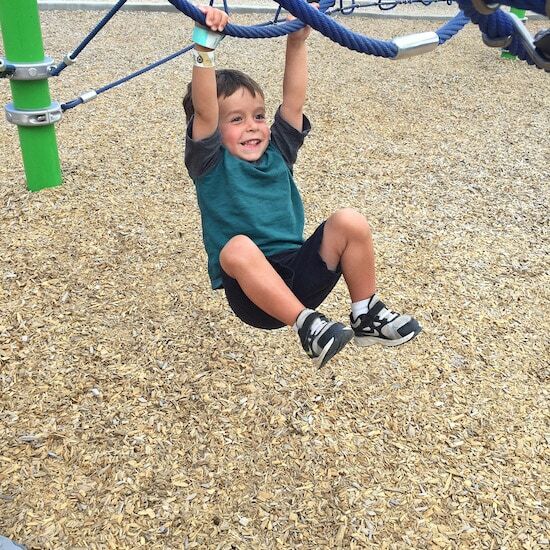 The Olympic Park is a fun place for kids of all ages! Thanks Park City for an amazing staycation! We will be back soon! Disclosure-this post is in partnership with Visit Park City, but our opinions are our own. Wow that is a NICE staycation. My satiation is getting my honey’s large to-do list done. Oh well. I’m glad you’re enjoying yours. Yes, we need to meet! We live close to PC too. Love spending time there. Thank you for sharing your happy memory making. I invite you to share your staycation post at my blog hop( link up now until Sat midnight) hugs! i wish we lived closer. That ice cream looks fantastic. my favorite part about ice cream in the summer is licking the drippy parts as they melt. 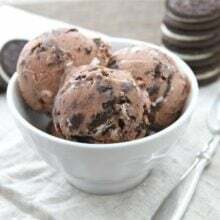 I am still dreaming about that ice cream. 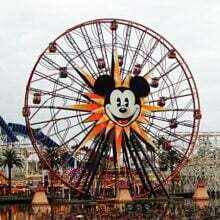 I need to go back ASAP! So fun!! Absolutely beautiful place, LOVE Park City! 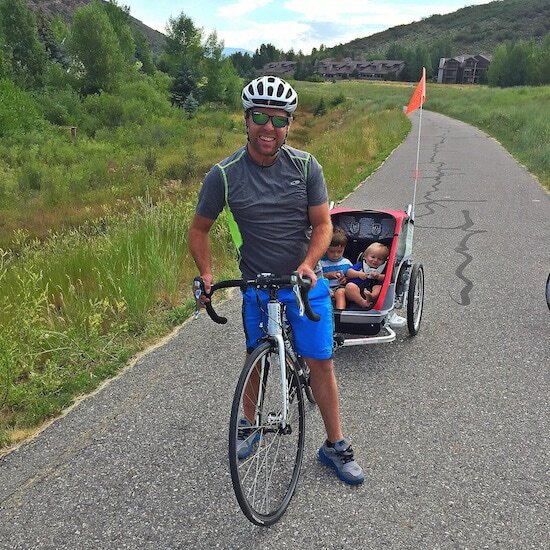 I Love Park City- you guys are so lucky to have it in your backyard! 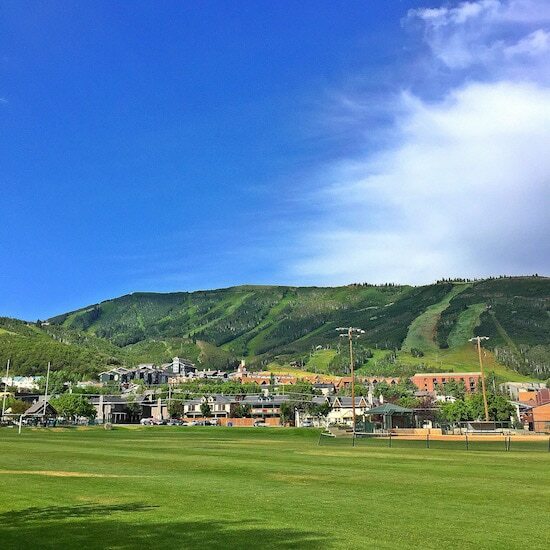 Wow…sounds like a fabulous “Staycation” – i’ve never been to Utah but it sure looks like Park City is a beautiful place with great places to visit and fun things to do. 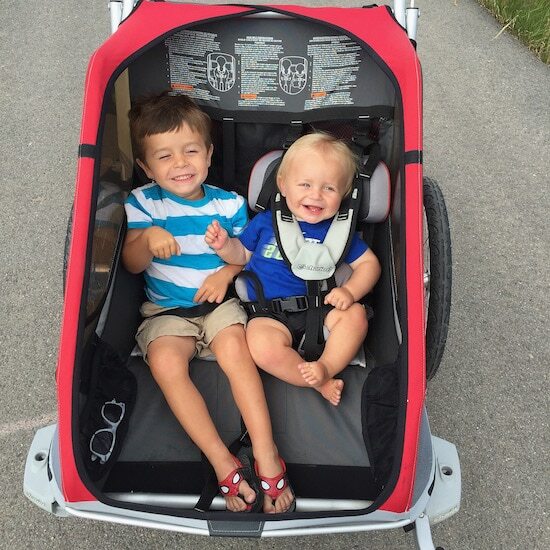 The pics of the boys are great as usual – they are so cute and they clearly had a great time! Awe. I lived in Park City for about 9 years before moving back to Texas and your post brings some nostalgia to me. Now, I’m not a snow fan so that creates a large problem in the winter but the summers there were always beautiful. I always loved Old Town and the parks there but I’m glad to be back in the Texas heat. 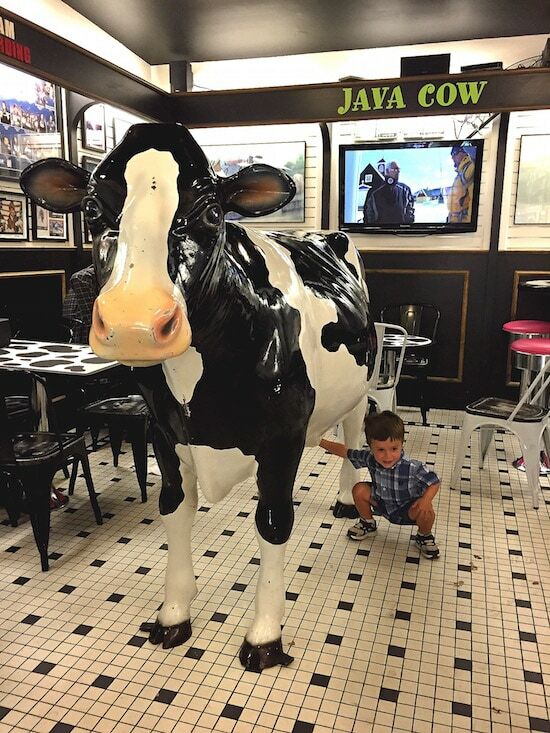 What a fun family trip…and that ice cream!!!! Looks like you had a great weekend that all 4 of you enjoyed. This looks like such a lovely weekend! Thanks for sharing!! Wow! I was there in January/February for Sundance but it was covered in snow! It’s amazing to see it in the summer time! 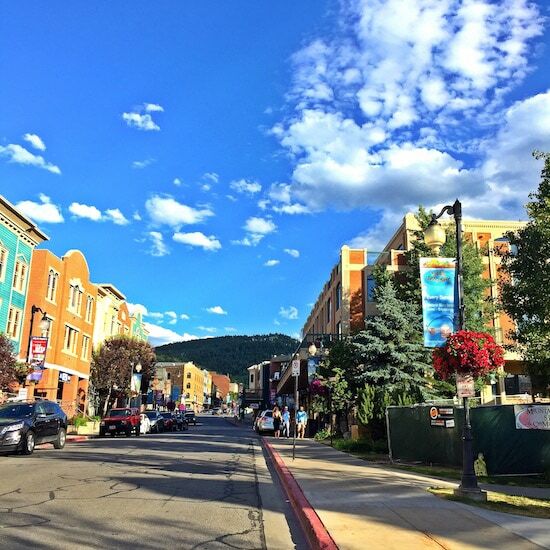 Park City is gorgeous all year round! So happy to have you and your family with us! Very nice place you described. 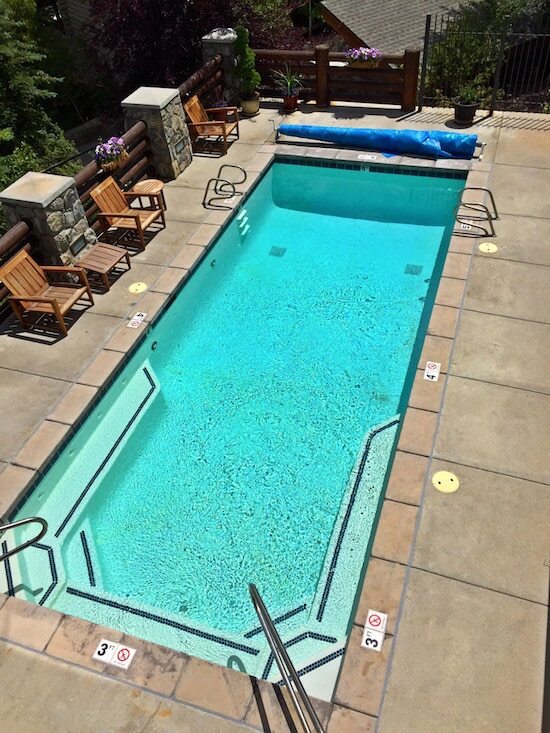 Everything you told about STAYCATION IN PARK CITY UTAH is very amazing. Surely I will go there at once. thanks for sharing a beautiful place.